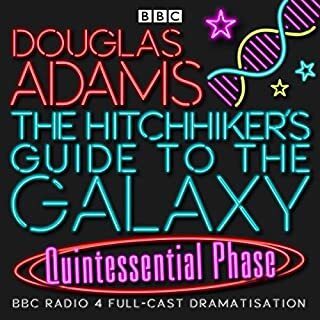 A dynamic remastering of the original BBC Radio 4 full-cast serial - Fit the First to Fit the Sixth - which spawned a phenomenal hitchhiking legend. 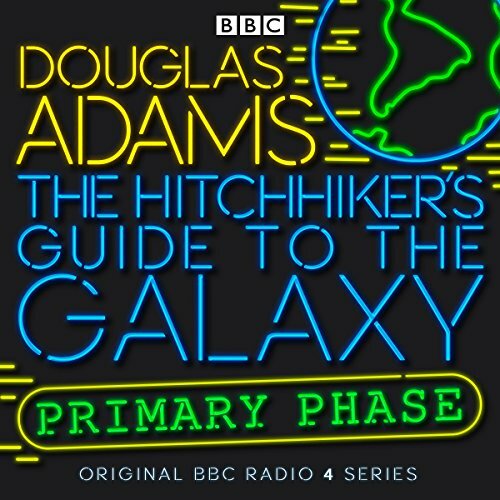 The original series of The Hitchhiker’s Guide to the Galaxy, remastered by Dirk Maggs (director of the Tertiary, Quandary and Quintessential Phases) to give a full, vibrant sound, now with Philip Pope’s version of the familiar theme tune and specially re-recorded announcements by John Marsh. Join Arthur Dent, Ford Prefect, Trillian, Zaphod Beeblebrox and Marvin the Paranoid Android in their first series of adventures as they witness the destruction of Earth to make way for a hyperspace bypass, stumble upon the ancient planet of Magrathea, dine at the Restaurant at the End of the Universe, and seek an answer to the Ultimate Question of Life, The Universe And Everything. Peter Jones, Simon Jones, Geoffrey McGivern, Mark Wing-Davey, Susan Sheridan, Stephen Moore and a full supporting cast star in these BBC Radio 4 episodes. 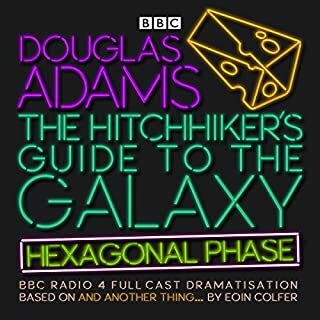 A special 55-minute bonus programme, Douglas Adams’s Guide to the Hitchhiker’s Guide to the Galaxy, explores the genesis of the radio series and its incredible success, with contributions from the original cast and production team. This review is specifically about the audio quality of the book. While the plethora of character voices were great, this is a radio program recording from a loooooong time ago and the quality of the audio shows. My wife and I both found it difficult to listen to in our cars because some of the voices are quiet and you have to turn it up, then all of a sudden you get a really loud high pitched space noise that blows your ears out. Constant volume knob adjustment is necessary if listening to in the car. I found listening to it at home on headphones much easier. I bought the "non-special edition" a few years back, ripped it myself and it sounded great. I can't find my digital versions, so I bought the special edition, regardless of the other negative comments. DO NOT IGNORE THESE COMMENTS!!! This is a horrible version. The sound mix is bad. It really does sound like the guys were in different rooms. Please, I beg you, do not get this one. If you can find the "non-special edition" get that one. Or, buy the CDs and rip it yourself. OK - those are strong words, and there really has been a lot of great writing in the last 50 years (I did say "possibly"). But the combination of imaginative genius, over-the-top humor and just enough philosophical thought makes H2G2 a true standout. 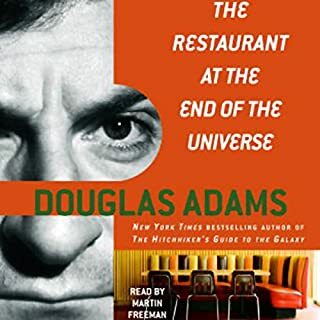 The radio plays predated the published books, and were my first exposure to Douglas Adams in the early 1980s - they remain the best way to experience The Hitchhiker's Guide. There are only a few audio books that I return to and listen a second time. 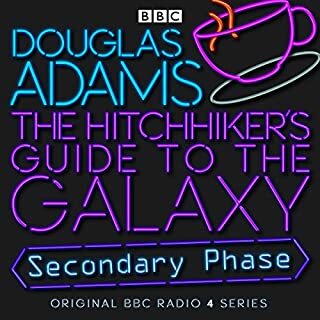 H2G2 is an audio book that I am moved to listen to at least every two years. Basically, I'd be lost without the Guide... If I could give it six stars, I would. P.S. 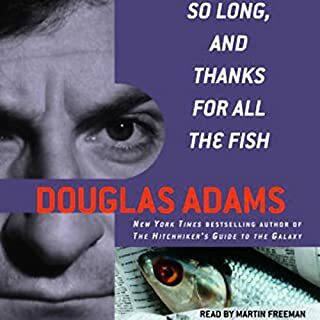 Years after I fell in love with the books, I learned that Adams had been a script writer and editor for the BBC's Doctor Who, and that he was a friend of Richard Dawkins - he introduced Lalla Ward (who played Romana on Doctor Who) to Dawkins, they subsequently married. 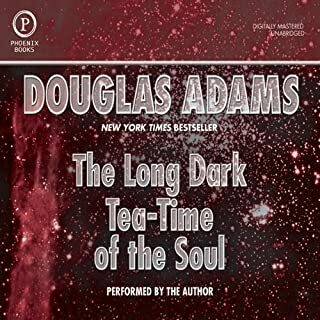 Lalla Ward co-narrates Dawkins' audio books, which I also recommend. 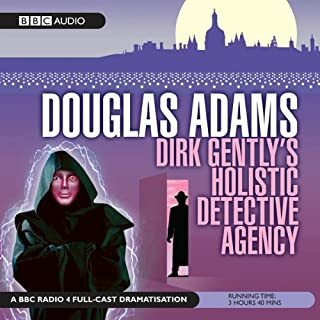 That serves to illustrate "the interconnectedness of all all things" (which is something you'll come upon in another of Adams' books - Dirk Gently's Holistic Detective Agency. If you are a fan of science fiction, or just comedy in general , this is a worthwhile listen. The form of humor in this series of radio shows has a very Monty Python feel, bizarre and perhaps a little random at times; however unlike python's sketch comedy and more akin to their feature films the comedy is tied together into a clever and original story arc. 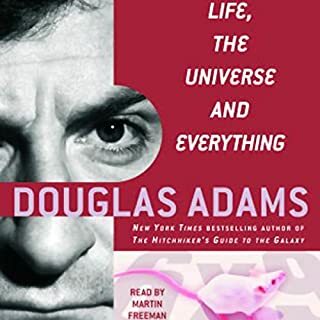 Whether it is proving that there is no life in the universe or finding the meaning of life in the universe, you'll find an interesting and comedic explanation to all your questions. For those who may have seen the movie the story arc is longer and differs in some large ways, the radio show is also funnier (this is not an opinion it is a fact). The only thing keeping this audio production from a 5 out of 5 is production quality. The production quality is over all pretty good, especially when one keeps in mind when it was produced. There are, however, a few spots in the recording where I had trouble understand what was being said due to effects placed on vocals. All in all I would recommend this audio show to anyone who enjoys chuckling at the bizarre. 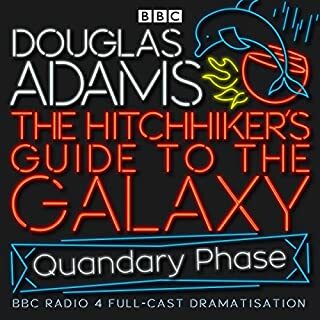 On Wednesday, March 8th, 1978, listeners to BBC Radio 4 first learned about what is perhaps the most remarkable, certainly the most successful book ever to come out of the great publishing corporations of Ursa Minor, The Hitchhiker's Guide to the galaxy. Now, at long last, it's available through Audible! Hear how it all started. This came before the books, before the TV series and before the movie. Get it now! Don't think twice! 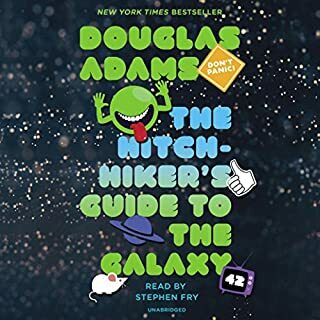 Don't miss any of the adventures of Arthur Dent, Ford Prefect and the other characters as they take you with them on a romp through the galaxy you'll never forget! If you think you know it all because you read the books, think again. And, most of all, Don't Panic! Always preferred the radio series. Superb. Takes me right back !! What great memories. What a great production. 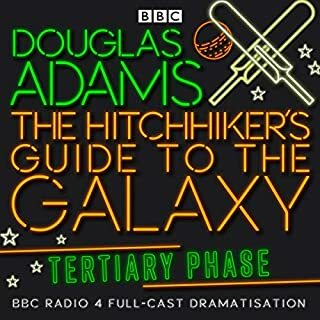 If your a hitchhiker fan and dont have the radio series, buy them - you wont be disappointed. It's just not converted to digital format well. Whispering and loud bangs, the levels are terribly normalized. Maybe if you use noice cancelling headset, and a volume knob... but not suitable for an ipod! Of course today, there is a quaint quality to those sound effects, but that only adds to the overall charm of the experience. I first discovered this show in the late 80s when a local radio station aired the series, and must say that more than 20 years later, a reading of the book (which not surprisingly seemed awfully flat) it felt just as fresh, off the wall and yes, innovative as it did the first time around. My number one concern with the was the quality of the recording. It was frustrating because the sound effects would be so loud but the actual talking would be very quiet. It made the whole story very hard to listen to and really took away from the quality of the story. There were also regular endings to the episodes so you'd have to fast forward through those sections. I would only recommend listening to this version if you are already a true fan of the book. I've had this for about a week... introduced my kids to it, and now, I'm about to starting my THIRD listen! The background info is also very fun! 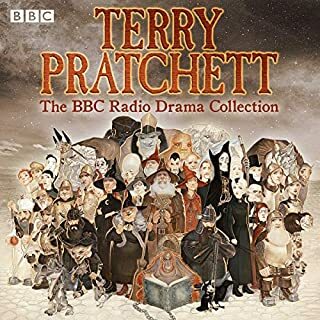 What a pleasure to rediscover this classic radio production on Audible. So full of ideas and imagination, that made me laugh out loud.